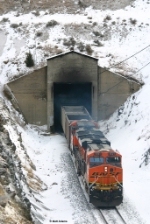 Title: SB Coal Loads at Cimmarron. Description: BNSF ES44AC 5921 leads a SB coal load waiting at the south end of the siding in Colorado Springs at Cimmarron. Train cosists of all new TGNX cars.This is just under the Colorado Ave bridge near the gate to the Drake Plant. 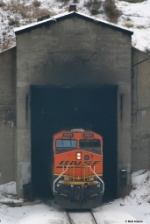 Description: BNSF Northbound Coal Train rumbles through Seymour, Mo. Description: The sun has risen above the hills just in time to catch BNSF 5921 snaking its way up the Hill. Description: Due to congestion north of Atlanta, NS was forced to reroute some empty coal trains from Plant Scherer via Macon/Columbus. Description: Lead by BNSF Power. Description: BNSF 5921 leads UP QGAMAJ-05 through Walshville, Illinois. 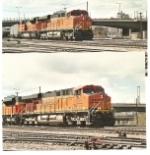 Title: BNSF 5014 sits with other's. Description: waiting to become the power for the MadGal. Description: Parked and waiting for a crew in Madison, Illinois.